Some people become quiet and can clam up when they are nervous or overwhelmed, while others can be the opposite. For those people it can be hard to express their thoughts and feelings, even if they want to in that moment. 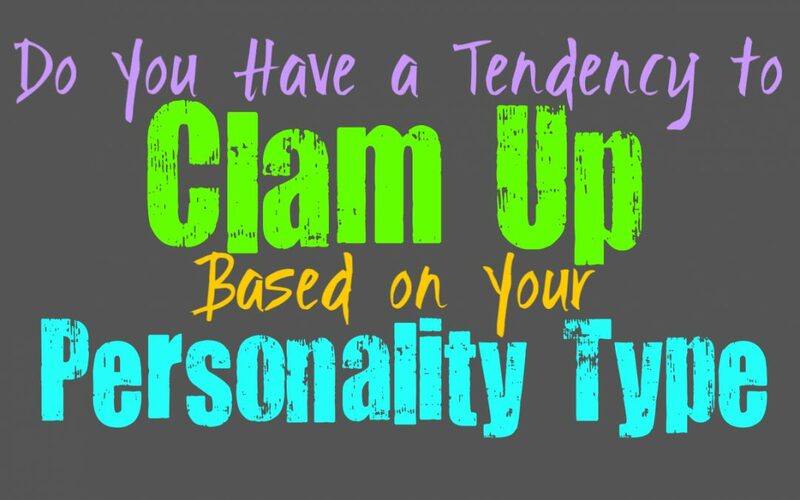 Here is how much you tend to clam or freeze up, based on your personality type. INFJs do sometimes freeze up when they are feeling nervous, or when their inner thoughts are a bit overwhelming. Their minds are such rich and active places that sometimes they find themselves pulled into their thoughts without really paying attention to what is going on around them. While INFJs can be vocal people when they want to be, that doesn’t mean they aren’t capable of becoming a bit frozen in certain situations. Their minds can end up drawing them inward and if they are feeling a bit nervous around this person they might struggle to be as vocal as they wish. ENFJs don’t often clam up, for them it is usually the opposite. They can be rather chatty and expressive people, especially when they are feeing nervous. ENFJs don’t remain quiet simply because they are feeling nervous about something, since the silence can sometimes make these feelings even worse. When they have something on their mind they want to share with others, it is often natural for the ENFJ to find a way to express these thoughts or feelings to those around them. Clamming up would be something the ENFJ would regret afterwards and that isn’t something they want. While INFPs are very expressive when it comes to their emotions and inner morals, they do have moments where they can clam up. For the INFP sometimes when they are feeling nervous about something they can struggle to really express themselves in an open manner. They do prefer to be able to share their feelings and be honest with others, but sometimes they cannot seem to overcome their nervous energy. They also have a lot going on inside of their minds and sometimes this can leave them struggling to find the right words to say when there are so many they want to express. ENFPs are normally expressive and outgoing people, but that doesn’t mean they don’t clam up sometimes. When an ENFP has been hurt in the past they can sometimes feel nervous about really opening up to people and sharing their feelings and pain with them. If the ENFP is afraid that what they say might lead to losing someone else, they can clam up and become afraid of their own words. Usually ENFPs prefer to be open and expressive with others, but there are instances where fear can cause them to clam up and struggle to really find the right words. INTJs are usually capable of expressing their thoughts and direction, if that is something they want to do. For the INTJ it isn’t about clamming up, instead it is about biting their tongue and keeping quiet when they don’t feel like opening up to people. They don’t often freeze out of nervousness, instead INTJs prefer to keep things to themselves since that is more comfortable for them. INTJs are only likely to really clam up when they are dealing with someone who wants them to express their inner emotions. These types of emotional conversations can be a bit overwhelming and they can struggle with finding the words to say. ENTJs rarely find themselves clamming up or freezing, especially in important situations where they need to act. ENTJs focus on maintaining a sense of efficiency and direction in their lives, and so for them control is very important. They just aren’t likely to find themselves clamming up when they need to responds to the situation in front of them. The only times where ENTJs might freeze a bit, is when someone is trying to have an emotional conversation with them, since discussing their emotions can be truly difficult for the ENTJ. INTPs do sometimes find themselves clamming up a bit, mostly because their inner minds can keep them rather distracted. There are moments when they struggle to express their thoughts, since they can’t always explain the process it takes to come to certain conclusions. Since their minds are so filled with unique ideas and so many different possibilities, it can actually be sometimes that causes the INTP to freeze up in certain situations. They are especially likely to clam up when they are discussing their emotions with others, since this isn’t a subject they are comfortable with. ENTPs try not to let themselves clam up in most situations, since they want to follow their intuition in the right direction. Freezing can often lead to them missing out on important experiences, and that would certainly be disappointing for the ENTP. They really enjoy diving into new things and want to be able to live their lives with a sense of freedom and excitement. For the ENTP clamming up could lead to them really losing certain opportunities which are important to them. The instances where they might struggle and find themselves freezing, is when they are discussing their own inner emotions with someone. ISTJs are very focused on getting things done and work hard to be practical and focused people. For them clamming up can mean missing out on important opportunities, or failing in a task they are trying to accomplish. ISTJs value efficiency and when people freeze they often fail to really get things done the right way. They would much rather be capable of accomplishing things with a sense of excellence, and so they don’t like to make mistakes which can cost them. For the ISTJ clamming up can be a truly negative thing, and so they try to avoid this. ESTJs are practical people who believe in getting things, and so they really don’t like to clam up. They especially want to avoid freezing in situations where they should be focused and efficient. ESTJs very rarely clam up, instead they do their best to accomplish their tasks to the best of their abilities. For the ESTJ failing really is not an option, and so clamming up really isn’t something they are likely to allow. The only instances where an ESTJ is likely to freeze and struggle to really respond, is when they are discussing more emotional situations. ISFJs don’t often clam up, especially in situations where they should be focused on getting things done. They are often stronger than people realize and are very capable of taking care of those around them. They care deeply for their loved ones and are highly focused on tending to their needs in a way that is helpful and practical. For ISFJs clamming up can mean making mistakes, and they often strive for a sense of perfection in their own actions and lives. They want to be able to maintain the harmony around them, and so they focus on being able to accomplish this without faltering. ESFJs really don’t like clamming up, especially not in important situations. They can often focus on getting things done without allowing their thoughts or emotions to block them up. In most instances the ESFJ is very good at pushing through any struggles in order to take care of their loved ones to the best of their ability. While in most cases they aren’t like to really freeze up, sometimes ESFJs can feel anxious when they are put on the spot. In situations where responding isn’t vital and they are feeling too much pressure to respond, they can clam up a bit. ISTPs are people who often act rather than allowing themselves to feel trapped by their emotions. If they want to experience something they go for it, and enjoy the thrill of the unknown. In most situations they aren’t likely to freeze up, not if it is important to them. Where ISTPs can sometimes clam up, is when they are dealing with a more emotional situations. They aren’t comfortable with emotions, especially not their own, and so in some circumstances this can cause them to freeze a bit. ESTPs are people of action and so because of this they rarely find themselves clamming up. In most situations they can think rather well on their feet, even in times of stress. ESTPs don’t clam up easily even when they are nervous. Instead of allowing their anxious feelings to make them freeze, ESTPs can actually become rather chatty and try to overcompensate for the situation. They prefer to act rather than allow their emotions to hold them back from getting things done or from really experiencing life the way they want to. ISFPs do act on things most of the time, instead of allowing things to make them clam up. It often takes the ISFP being deeply nervous and overwhelmed for them to actually freeze up in a situation. Most of the time they follow their instincts and their hearts, which causes them to be more open and expressive people. In most situations ISFPs prefer to really act on their thoughts and feelings rather than allowing things to hold them back or leave them feeling frozen. ESFPs aren’t likely to hesitate or clam up, instead they are likely to respond to the situation to the best of their ability. When the ESFP is nervous they aren’t like to clam up, instead they can become rather chatty and even more expressive. They are people who act on their emotions and their thoughts, instead of allowing things to hold them back. For the ESFP it comes naturally to respond in the moment, and so clamming up just isn’t how they are likely to respond.